In another Smart Witness clip, we see a Nissan Note knocked across the full width of the M6, barely missing a BMW 5 Series. 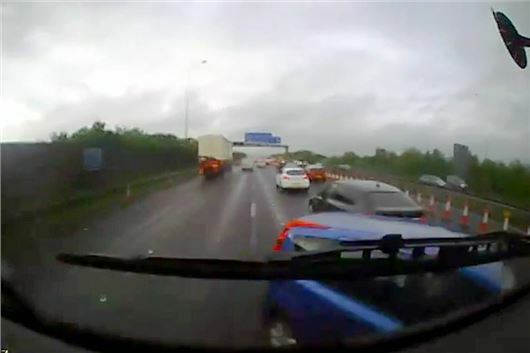 The footage was shown to insurers and resulted in the truck driver being cleared of all blame. The video can be seen below. The clip shows the lanes being redirected to the left through road works. The Nissan Note fails to move over to the left, instead following the original white lines. This results in a collision with the front left of the truck cab. Initially the driver of the Nissan Note blamed the truck driver, but after being shown the footage admitted fault. I would blame the traffic controllers. The signage is woefully inadequate to expect 4 lanes to move left in perfect synchronisation. The old lane markings should have been erased and new lines used to guide the traffic.